Unlike its predecessors, 2015 witnessed judgments delivered in form of separate pieces of a jigsaw puzzle. So much happened in past 12 months that by the year end it has become really tough for research scholars to connect dots and form a chain of events. In a richly woven tapesty of our judicial fabric there are 6 unique dots which require a distinct observation. In this piece we concentrate on 3 powerful dissents and 3 notable split verdicts by the Supreme Court in 2015. The normal procedure of Supreme Court is that judges sit in a combination of minimum 2 judges (except in arbitration petitions for appointment etc). The Chief Justice usually sits in his Courtroom No. 1 with two judges. Other 3 judge benches may also be constituted from time to time by the Chief Justice of India. If the combination of a two judge bench differs in their opinions, the matter also gets referred to a 3 judge bench. Ideally if a two judge bench thinks that a matter involves an important question of law it has to refer it to a three judge bench which can hear and decide it. If the three judge bench feels that a 5 judge bench should hear it, it can further refer and then so on in odd number of judges. Notably, in Keshvananda Bharati 13 judges heard the matter. However, there are exceptions to this and there are instances where a 2 judge bench referred the matter directly to a 5 judge bench. A bench of combination of 5 or more judges is termed as a ‘Constitution Bench’. All decisions of the Supreme Court have to be taken by majority. A judge is free to pen his own dictum in any case he has heard for final arguments. His opinion may be a majority opinion, concurring opinion or a minority opinion. If he writes a minority opinion, his judgment can be either a partial dissent or a complete dissent from the majority view. A minority opinion though may have a pursuasive academic value, is not binding. 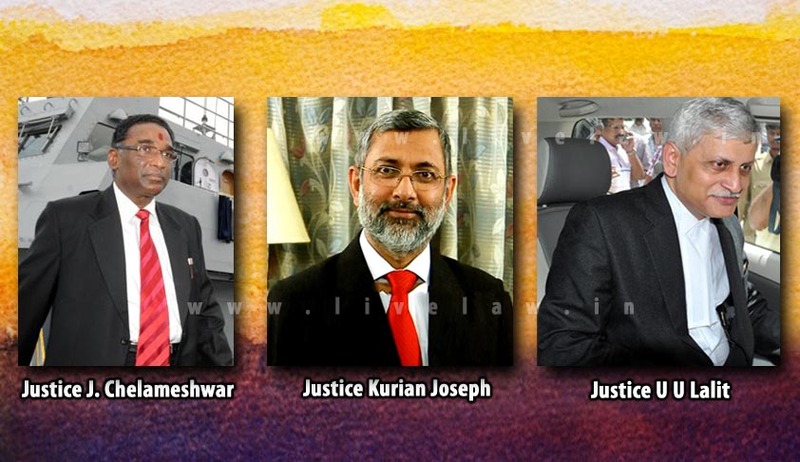 Undeniably, the most hotly debated split verdict of 2015 was the head on collission of opinions of Justice Dave and Justice Kurian Joseph in Yakub Memon’s execution case. Justice Dave dismissed Yakub Memon’s Curative Petition while Justice Kurian Joseph ruled that the Curative Petition, as challenged by way of a Writ Petition, needs to be considered afresh and stayed the death warrant. In view of the conflicting decisions, the registry was directed to place the papers before the Chief Justice of India, for constitution of an appropriate bench for hearing the Court on merits. As is well known, the historic midnight hearing after dismissal of the curative reference also was conducted but Memon was executed as the Court found no reason to interfere. In M/s Periyar & Pareekanni Rubbers Ltd. v State of Kerala, in a split verdict, relating to payment of compensation under the Land Acquisition Act, 1894 for the solatium should be from the date of acquisition or from date of pronouncement of the constitution bench judgment in Sunder , a bench of Justices V. Gopala Gowda & Adarsh Kumar Goel referred the matter to a 3 judge bench. However, no terms of reference were pronounced. Another notable dissent which dragged itself from 2014 to 2015 was the Uphaar Cinema sentencing verdict. The Supreme Court let off cinema owners Sushil Ansal and his brother Gopal Ansal asking them to pay a fine of Rs 30 crore each to the government within three months. A bench of justices Anil R Dave, Kurian Joseph and A K Goel pronounced the quantum of punishment in the case. Earlier a bench comprising of justices T S Thakur and G S Misra had, while disposing off the appeal filed by the brothers, upheld their conviction for causing death due to negligence but had left the decision of sentence to a larger bench following difference of opinion between the judges. Justice Misra while was in complete favour of imprisonment, Justice Thakur deemed it fit to impose fine and let go the offenders. Supreme Court is a court of ‘law’. It must not be compromised that its very existence is different from being a court of ‘justice’ like the ICJ. Its primary and perhaps only duty is to uphold a ‘rule of law’ in country. This ‘rule of law’ must not be confused with a ‘rule by law’, ‘rule under law’ or ‘rule with law’. If the law says two plus two is four, the Supreme Court is duty bound to uphold it. With powerful dissents and splits of such nature as we read above, where 3 judges say it is four and 2 judges say it is five, a doubtful assumption crosses the mind whether the majority opinion is correct. As per law only majority opinion is binding and minority view is nothing more than an opinion on the subject of academic value. Although judges are free to author their opinions, yet it is not a healthy practice to have diametrically opposite views on a subject matter. When such clashing opinions are obtained, it suggests that the court of law is transforming itself whimsically into a court of justice which is very much against its existence in the first place. Lately, Supreme Court has assumed a wide range of roles in its activism to claim victories in view of maintaining democratic order in the courty. Time shall decide whether these victories were pyrrhic or not. Till then, we as pen pushers wish good luck to the ‘Rule of Law’. Fingers crossed!